It's always a joy to stay overnight directly on the path. The convenience is one thing, but also you often meet like-minded walkers in the bar or over breakfast. And so it was at the Moorcock Inn, where we chatted with a couple from Ayr. They were in the area with their local walking group, the majority of whom we'd met the previous night in Hawes YHA, but our friends had made the sensible decision to eschew dormitories, bunk beds and self catering for this comfortable B&B. Although the weather forecast for today was significantly better than yesterday's, we set out from the pub into a persistent drizzle. A relatively short climb took us to Lady Ann's Highway, a track which although level became higher and higher above the valley floor as the nascent River Eden dropped away. Heads down into the wind we didn't see the allegedly beautiful Hell Gill, but did stop for a breath at the Water Cut sculpture. Beyond here the path dropped to the valley road but before then the view was delightful, with rich farmland ahead, flanked on either side by the high, rocky moorland of Mallerstang Common. 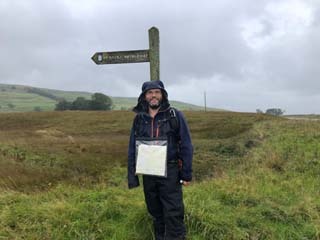 The rain held off during our descent but returned as we ascended the flank of Wild Boar Fell to the pass at High Dolphinsty. Hopes of a clear view ahead were dashed by yet more low cloud, but at least the precipitation wasn't too heavy. Rather soon we reached tarmac, and before long the A683 where the Pennine Bridleway presently comes to a rather abrupt and underwhelming end. Plans to extend the trail for another hundred miles or so through Northumbria to Byrness have been approved but no funding has been secured to construct the path. All in all the Pennine Bridleway isn't the best National Trail. It has its moments; it runs through some spectacular scenery, but by design it doesn't follow a natural theme. Instead its purpose is to get people to places. For walkers it's a good route for passing swiftly from the Peak District to the North Pennines. Perhaps it'll find purpose as an element of LE-JoG routes that don't want the drama of the Pennine Way. For me it'll always be the National Trail I was least fussed about finishing, but when I realised I was so close to completing all the others it would have been churlish to omit this one. Walking from the end of the trail to the railway station at Kirkby Stephen we could make out the radar station on Great Dun Fell and to its north, the bulk of Cross Fell. I remembered the Pennine Way's onward route, and how just a couple of days' walking from where we stood would take us to Hadrian's Wall. National Trail 14 is complete. Just one left, and it's along that Wall. Posted by pab at 13:53 | Comments will be back one day. Please email me instead!